The only way to travel by land between Armenia and Turkey is through Georgia. 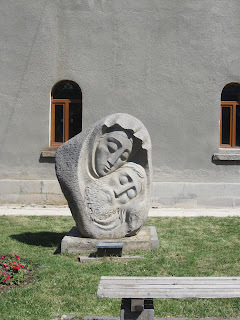 The last part of our journey through Western Armenia took us back through Erzurum and Kars, and to the Armenian enclave of Javakh in southwestern Georgia, where we spent two days before returning to Yerevan. Led by the then bishop of the Erzurum Diocese, Javakh was settled by the Armenian inhabitants of Erzurum beginning in the mid-1800’s, when the Armenians began experiencing oppression from the Ottoman Turks. 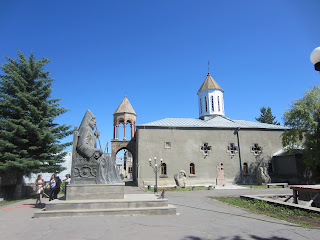 Today, Armenians are oppressed by the Georgians who are making efforts to integrate the villages with Georgians. 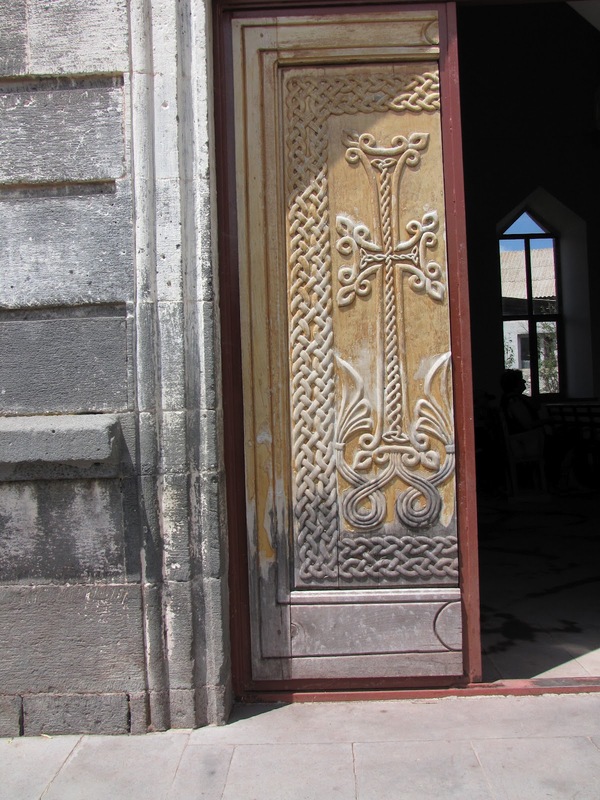 The children are not allowed to speak Armenian in the schools, or openly in public areas. 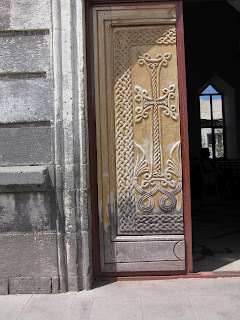 Many of the Javakh Armenians are not baptized, and the Georgians discourage Armenians from attending Armenian churches. Efforts are underway to baptize all of the Armenian children in the region. Notably, a few years ago the Georgians confiscated the historic Norashen Armenian Church in Tblisi, and has been systematically removing any evidence, including Armenian gravestones, that this was an Armenian church. 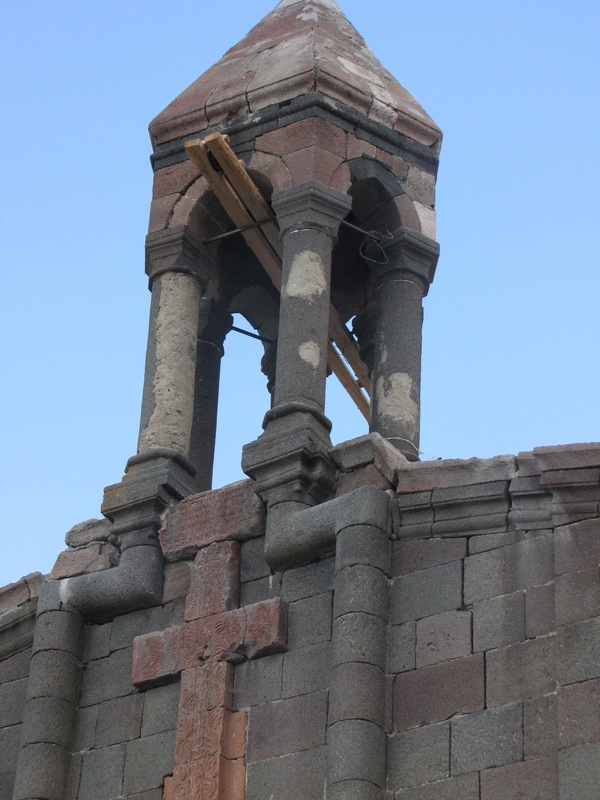 Several other Armenian churches have been confiscated by the Georgians, and efforts are underway to persuade the Georgian government to return those churches to Armenians. 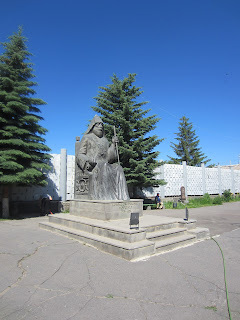 Read more about the Javakh Diocese here. 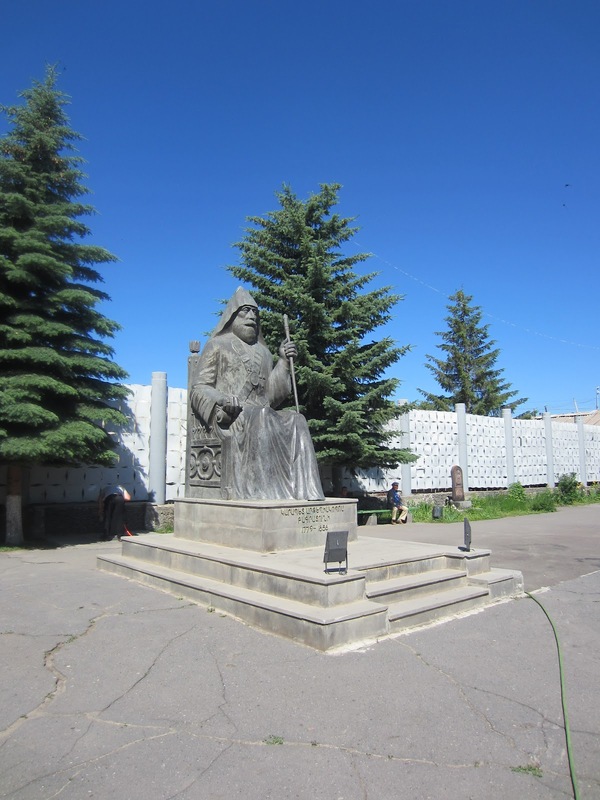 The Armenian religious community of Javakh is under the supervision of The Very Rev. 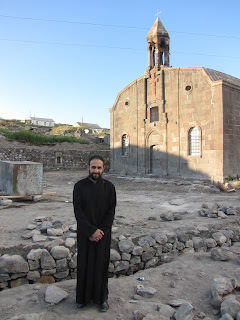 Father Papken Salbiyan, the Vicar of the Armenian Church Diocese of Javakh. 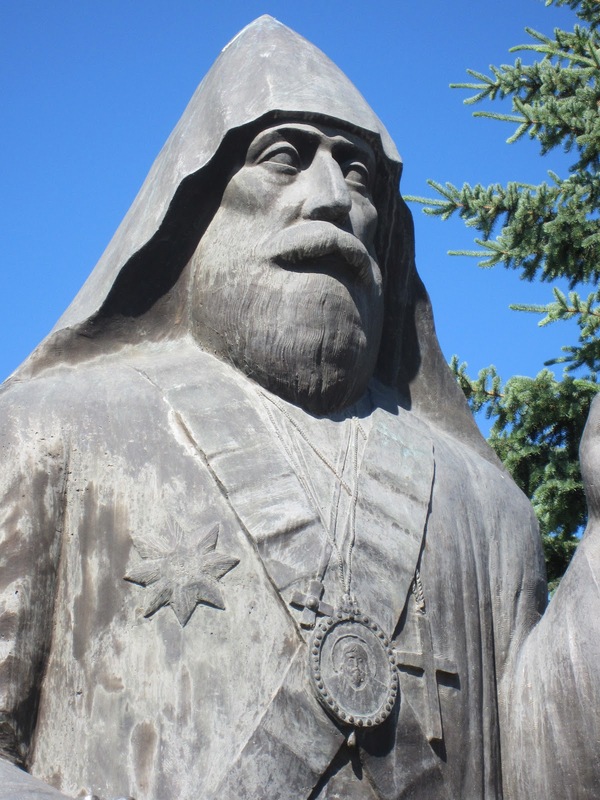 Hayr Sourp supervises the seven or eight Armenian priests assigned by Etchmiadzin (The Mother Church) to Javakh. 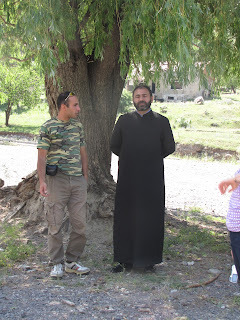 We had the distinct pleasure of spending a considerable amount of time in the town of Akhalkalaki with this very dynamic and passionate priest during our short stay. His love for the Armenians of Javakh was so evident and his concern for the economic, social and political difficulties this Armenian community is facing because of Georgian political oppression is heart breaking. 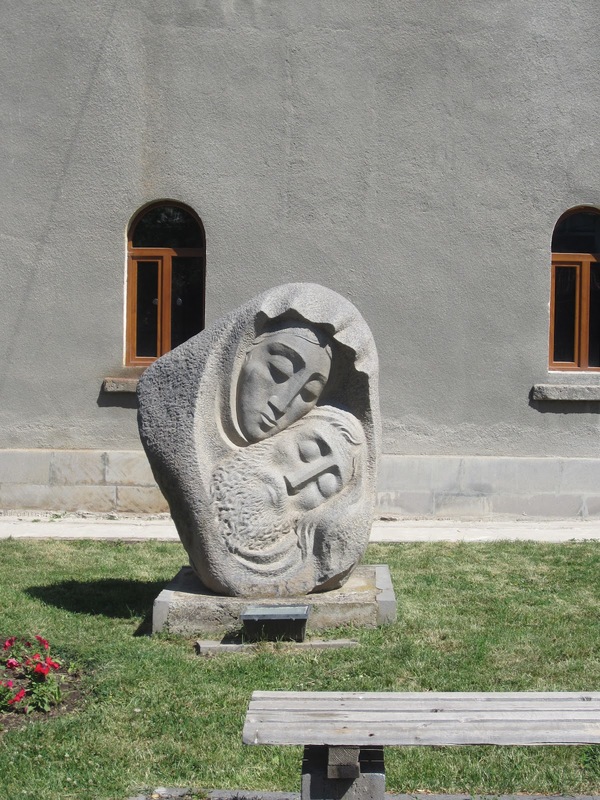 Just up the block from the Diocesan Headquarters was the area church - Holy Cross Armenian Church. This church was established by the Bishop of Erzurum in 1856 and was recently renovated. It is an operating church. 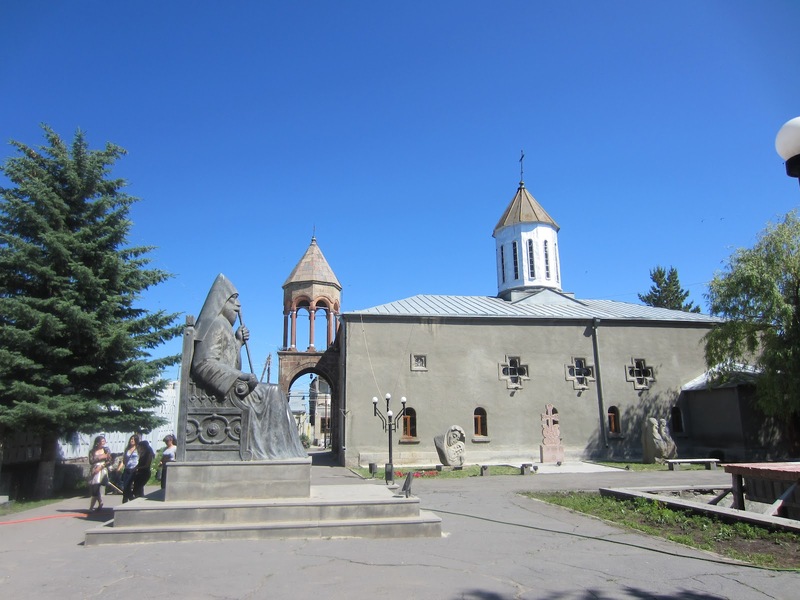 Javakh has several historic Armenian churches. 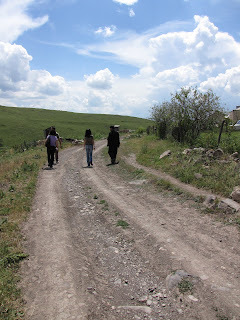 We were escorted by one of the local Armenian priests to Sourp Garabed Church in the small rural village of Gartsagh during the evening of our first day there. The church, built in the late 1800’s, until 2 months ago, was half buried in dirt. 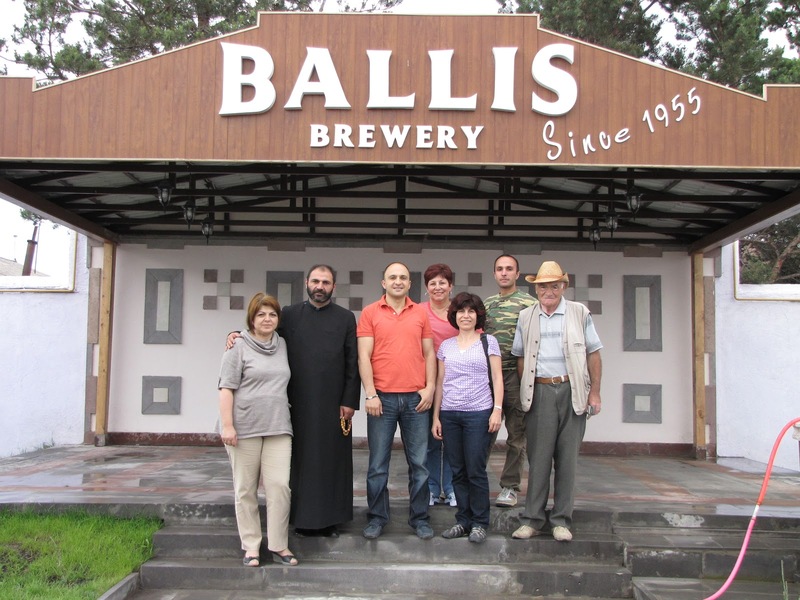 Thanks to a benefactor born in Gartsagh but now living in Armenia, the villagers began the church’s restoration about 3 months ago. Today, one can walk through the side entry door and see a beautiful church, which will soon be consecrated. The village is the last along the road that leads to the now-closed border with Turkey. We were told that talks are ongoing about opening that border, which would cut the amount of driving time from Armenia to the historic city of Kars and Ani in Turkey by several hours. 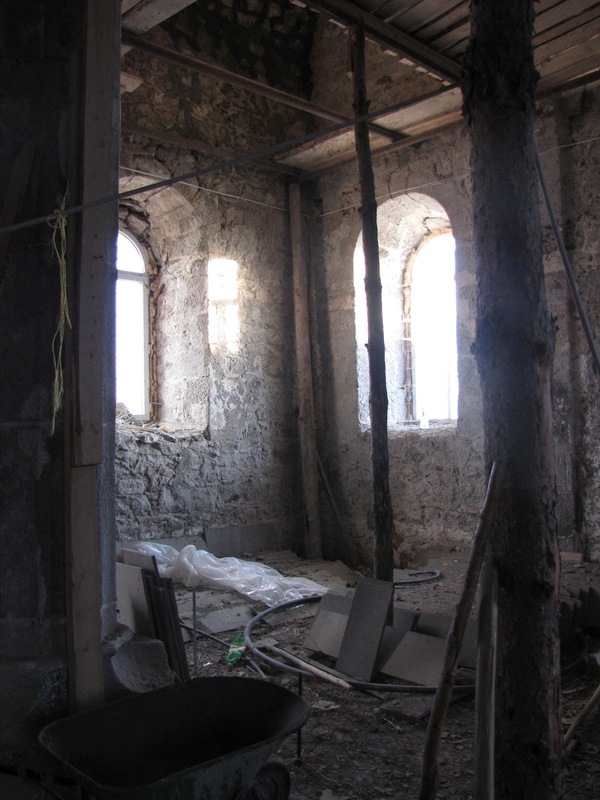 Because the border might someday be opened, Hayr Papken insisted that the church in Gartsagh should be restored as soon as possible. Regardless of whether the border opens, this church was well worth the effort! The next day, we had the good fortune to visit with the children of Akhakalaki, who sang for us. 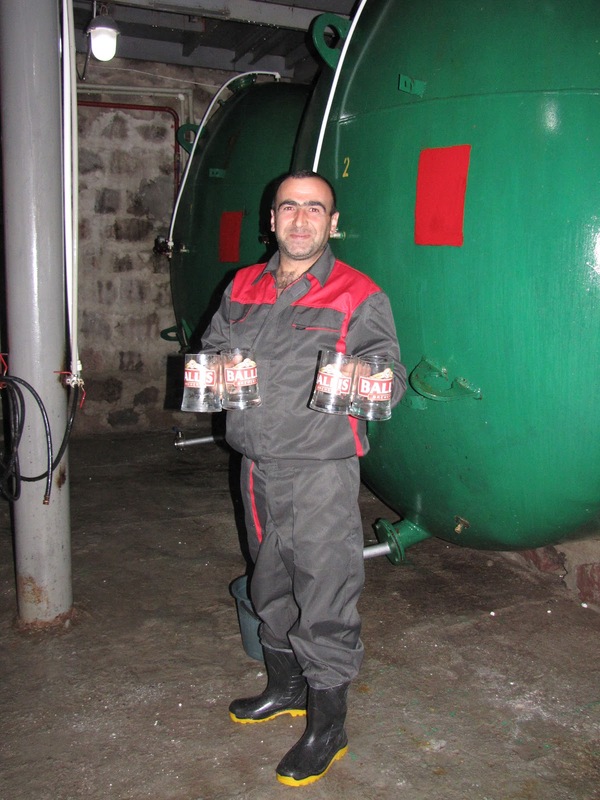 They participate in a summer program directed by Hayr Sourp for social orphans and the Armenian children of the region. The older children then entertained us with a very clever puppet show that was written by the students from historic stories. Hayr Papken told me that the materials to make the puppets were donated by my good friend Dr. Garo Garibian from Philadelphia. It was a delightful show! 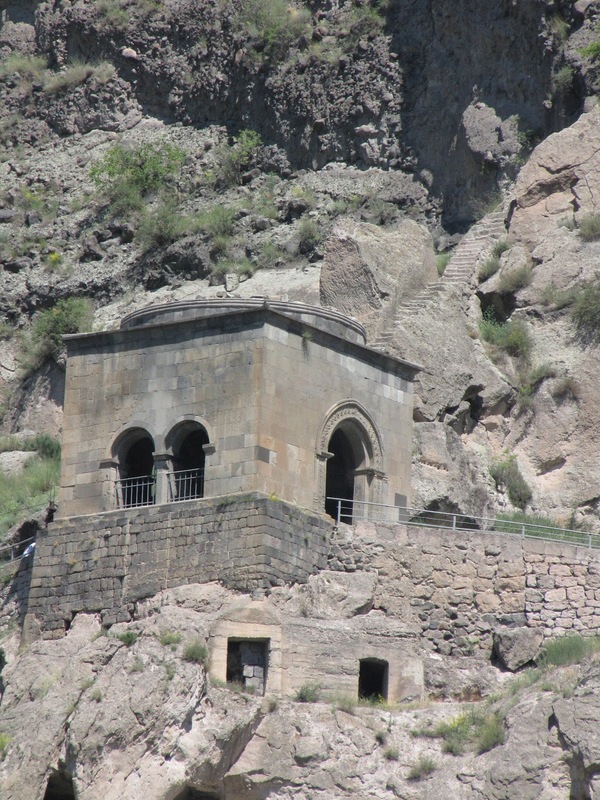 Hayr Sourp accompanied us on a drive to the historic Khartsvisi fortress in the region. Built in the 12th century, it remains largely intact. From there, we continued along the road and saw, across the river, the remains of another fortress. Continuing a small distance further in this historic region – with a little interference from the local cows – we pulled over into an area where we could park and walk. Walking to the edge of the area, we looked over the wall down to the river. On the other side of the river, high up on the mountainside, we saw an amazing site. Lining the side of the mountain was a stretch of caves, bordered on one side by a fully intact building, and the arches, with small bells, of a church – this was the remnants of a monastery – Vardzia -- which was originally built inside the mountain. The large part of this multi-level structure was built in the 12th century, although excavations have uncovered evidence of inhabitants dating several hundred years earlier. 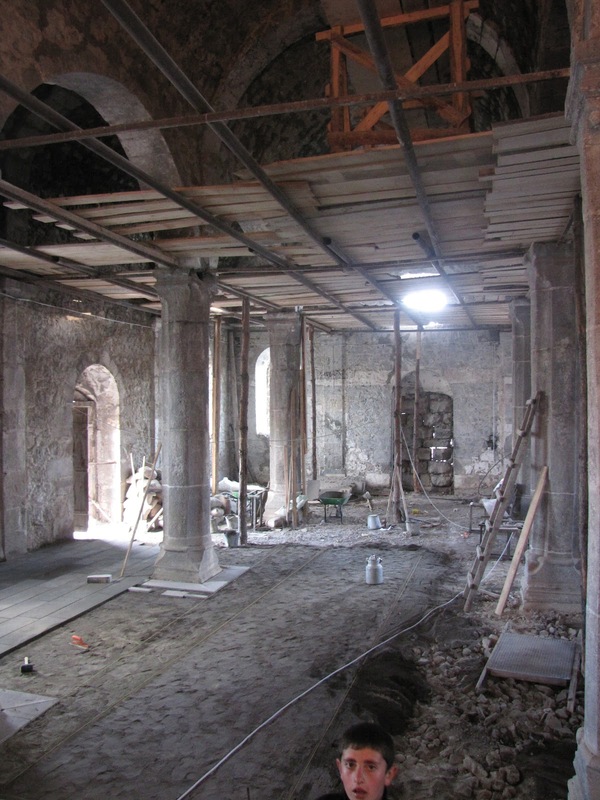 In 1283, an earthquake damaged the monastery and it was largely abandoned for several hundred years. 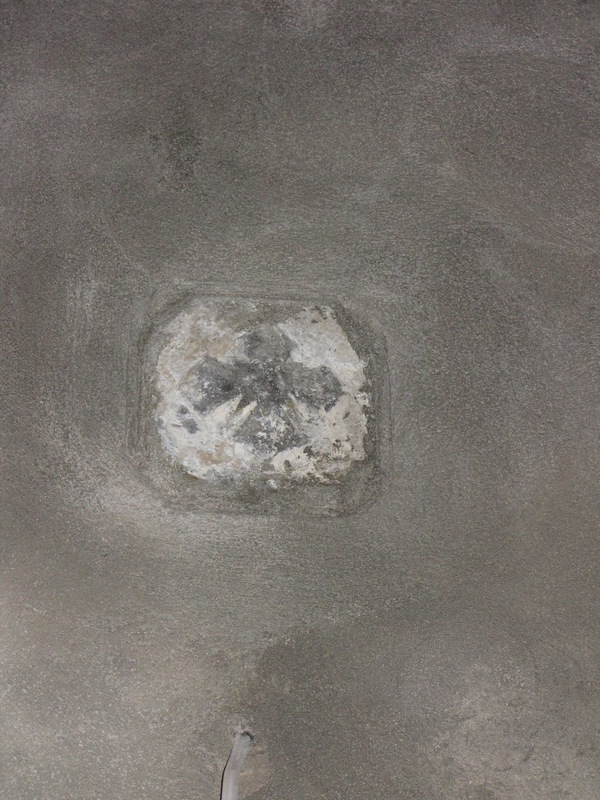 It has now been submitted to UNESCO for inscription of the World Heritage list. 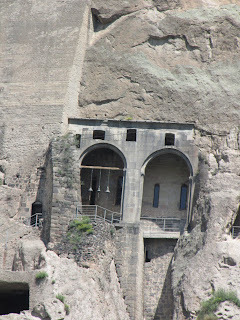 Although we could have driven across the bridge and up to the caves, and walked through them we elected not to – and, given my fear of heights, I would have napped in the van had the others chosen to do so! Read more about this archeological masterpiece here. We also visited the small village of Arakova where we saw the newly renovated church built in 1905 and enjoyed watching the kindergarten children sing a few songs for us. The church was heavily damaged during 1918-1921 when the political stability of the region was in chaos after the war and before the treaty of Kars. These kindergarten age children are the choir for Sunday services! They knew the Divine Liturgy! 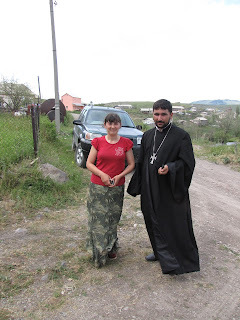 Afterwards, the Der Hayr (local married priest) led us by car over the completely unpaved bumpy village “roads” to his home, where his wife (Yeretzgin) had prepared a very delicious lunch for us! What a delight it was to spend time with them – and, we enjoyed some amazing fresh honey from Der Hayr’s bee hives! 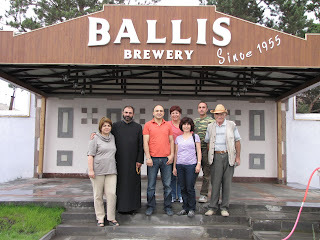 After our return to the city, we visited a beer factory in town that has recently been established by an American Armenian and his partner from Armenia. 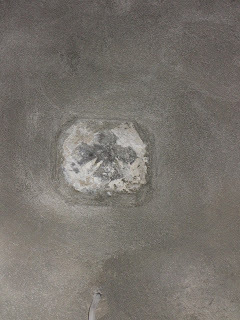 This was an amazing facility - immaculate and modern - on a large piece of property. 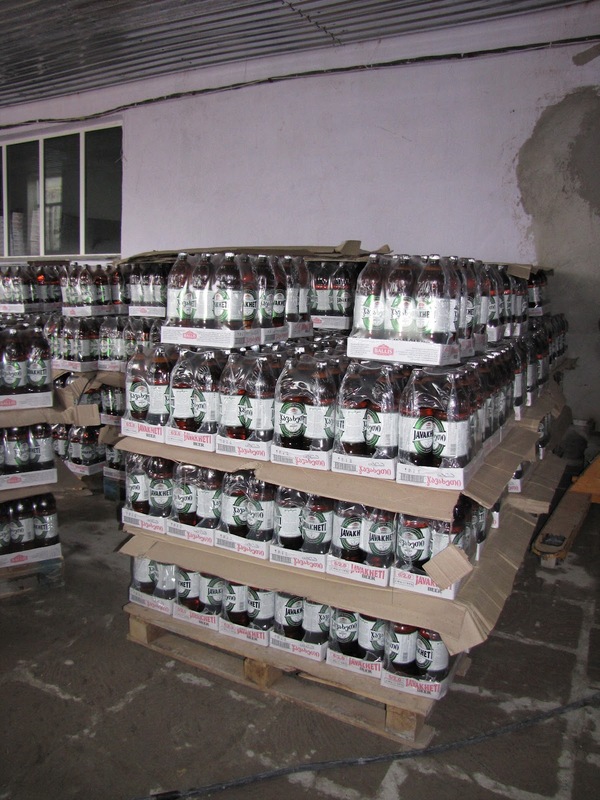 The owner was proud of the fact that, when the factory was up to full speed, it would provide jobs for a great number of people in the Javakh reason. 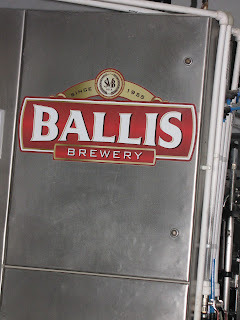 We tasted the beer, which was good (not being a beer drinker, it was fine for me!). 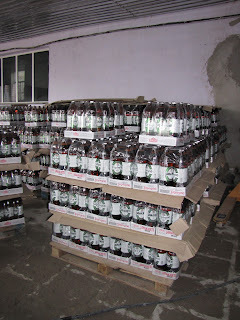 I have never seen beer bottled in 2 liter plastic bottles before, as they were at the Ballis Brewery. Makes sense to me! 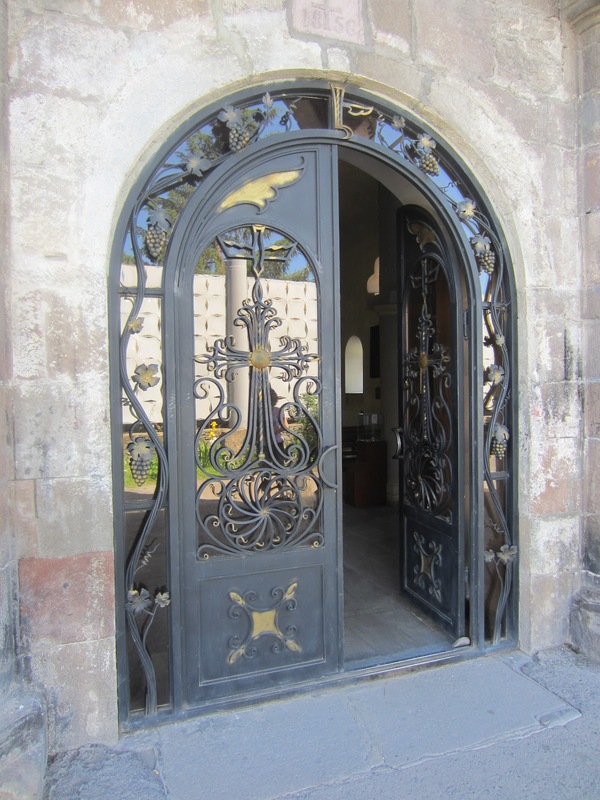 We returned to our hotel – the only modern hotel in the city of Akakhalaki – which was just a half block from the Diocesan headquarters, and had a late dinner with the Der Hayr and Hayr Sourp, after making a late evening visit to another village where an intact Armenian church stood. On Friday, June 22, after visiting the local museum, we started our journey back to the Georgia/Armenia border and our return to Yerevan. This journey through Western Armenia and Georgia was memorable in so many ways and we met so many wonderful people. 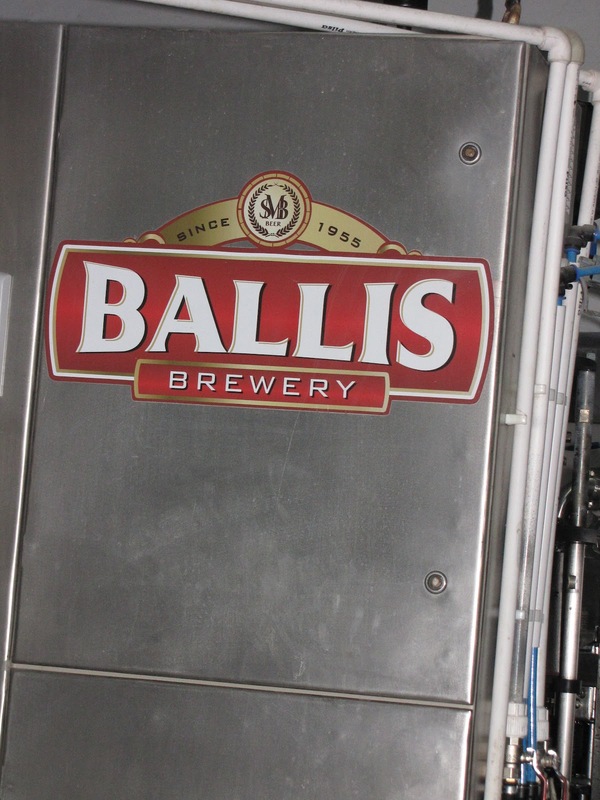 I am very glad we decided to make this trip!